Ears are responsible for your sense of hearing and your sense of balance. You hear sounds because your ears pick up sound waves and transform them into electrical signals which travel along nerves to your brain. Your brain then “decodes” and interprets the signals. The organ of balance (the vestibular system) in the inner ear also sends signals to the brain, which perceives and interprets every movement and change in position. When are ear examinations recommended? If you have sudden or gradual hearing loss, ringing in your ears (tinnitus), earache, dizziness or if your doctor thinks you might have a middle ear infection. Also, if a fluid comes out of your ear or if you have injured your lower jaw. This is because lower jaw injuries can also damage the ear and ear canal. How can you prepare for an ear examination? There is no need to prepare for an ear examination. But the ear canal (auditory canal) and eardrum are quite sensitive, so it is important to hold your head still during the examination in order to avoid pain. If the doctor touches the back wall of your ear canal with an instrument, it might make you want to cough. Before examining your ear, your doctor will ask you a few questions, such as whether you have earache, ringing in your ears, dizziness or problems hearing. Information about previous ear problems or any hearing problems in your family could be important too. After talking with you about these things, the doctor will usually first look inside your ear using an instrument called an otoscope. This may be followed by other kinds of examinations or tests if necessary. Your hearing can be tested in different ways. Doctors typically use a combination of different methods. There are subjective hearing tests, which depend on patients’ own reports of what they can hear. These include whispered and spoken voice tests, tuning fork tests and audiometry tests. And there are objective hearing tests, which don’t depend on patients’ reports of what they can hear. Instead, their hearing is measured using special devices. Examples of these tests include tympanometry, OAE tests and auditory brainstem response tests. In this examination, the doctor looks into the ear using an instrument called an otoscope. The otoscope consists of a handle and a cone-shaped attachment called an ear speculum, which contains a tiny lamp and is inserted into the ear canal. To make it easier to insert the otoscope into the ear, the doctor straightens out the ear canal by gently pulling the ear upward and backward. Earwax or dirt can be removed during the examination. 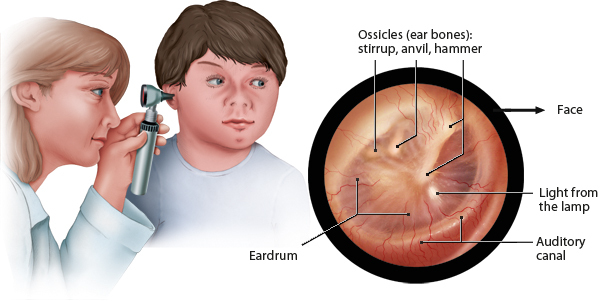 The eardrum is usually a shiny gray color and smooth. If it’s red, injured, scarred or has a bulge in it, you might have an ear infection or another kind of ear condition. In this test, the doctor says four-syllable numbers while standing six meters away from the patient, whispering at first and then speaking at a normal volume. If the patient doesn’t understand what was said, the doctor moves closer. This is done separately for each ear. To make sure that the patient doesn’t lip-read, the doctor hides his or her mouth. In tuning fork tests, the doctor holds a vibrating tuning fork at the entrance to your ear canal and places it against your head. This tests how well sound is conducted through the air and through your skull bones. It provides information about the type of hearing problem: If you can only hear the tuning fork when it is placed against your head, the root of the hearing problem lies in the ear canal or middle ear. If you can’t hear the tuning fork in either of the two positions, you have what is known as sensorineural hearing loss. This means the root cause lies in the inner ear, the auditory (hearing) nerve, or the nerve cells in the brain. In pure tone audiometry, headphones or loudspeakers are used to play tones at various frequencies (pitches) and increasing volumes. As soon as you hear the tone, you give the person carrying out the test a sign. In speech audiometry, you try to hear spoken syllables and numbers rather than tones. The number of words or numbers you heard at different volumes is then assessed. This test is also used when adjusting hearing aids. Tympanometry measures how much the eardrum can move (vibrate). If the eardrum hardly moves at all, it is a sign that fluid has built up in the tympanic cavity behind the eardrum. To carry out the test, the doctor first inserts a “bung” into your ear canal in order to seal this part of your ear. Although this can sometimes be unpleasant, it generally doesn’t hurt. The instrument then changes the pressure in your ear (low pressure and high pressure), and a tone is played. The tone’s sound waves cause the eardrum to vibrate, which changes the pressure in the ear canal. This change in pressure is measured and recorded. OAE (otoacoustic emission) tests are used to assess the functioning of the inner ear, where the sensory cells are found. Sensory cells are also known as outer hair cells. Sounds reaching the inner ear cause the hair cells to vibrate, and as a result the hair cells produce sound waves themselves. During OAE tests, soft clicking sounds are made. The sound waves produced by the hair cells are then picked up and measured using a special microphone. This procedure doesn’t hurt and is also used for routine hearing tests in newborns. The auditory brainstem response (ABR) test is a special kind of electroencephalogram (EEG) – it measures the electrical activity in the part of the brain that receives signals from the auditory (hearing) nerve. This test is also called “brainstem-evoked response audiometry (BERA).” The hair cells are stimulated by sending clicking sounds to the inner ear using headphones. The resulting electrical signals that are sent to the brain along the auditory (hearing) nerve are then measured. This test is particularly useful for diagnosing hearing loss caused by damage to the auditory nerve.